Warning: Screen readers are not supported by Firefox Quantum browser as of March 20 2018. Combined SHIRPA/Dysmorphology - This test examines abnormalities in behaviour and morphology. The basic behavioural assessment measures muscle, cerebellar, sensory, neuropsychiatric, and autonomic functions by observation for a variety of normal and abnormal spontaneous behaviours and also measures activity levels, arousal, respiration, gait, muscle tone, reflexes, and aggression. Each mouse is observed first for behaviour and then gently scruffed while examining the condition of the coat hair, skin, head, external genitalia, forelimbs, hindlimbs, and tail. Slit Lamp (Eye) - The slit lamp (Haag-Streit BQ900, Innova Medical Ophthalmics) is used to check the anterior section of the eye for defects such as cataracts and glaucoma. The awake mouse is scruffed and held in front of the slit lamp while a light is shone into its eyes. The intensity of that light is then changed so that the size and shape of the pupil and the contraction of the iris can be observed. Next the pupils are dilated using a mydriatic solution so that the lens can be screened for any defects and photographed. Fundoscopy (Eye) ‐ Fundoscopy is used as a rapid screening method for the visual inspection of the back of the eye (fundus/retina). The pupils are dilated using a mydriatic solution and the mouse is anaesthetized. An ophthalmoscope (Phoenix Micron III digital camera system) is used to direct a bright light into the mouse eye enabling the inspection of the fundus and provides high‐resolution documentation of retinal and choroidal structures. X-Ray - This test is used to measure skeletal abnormalities. The anaesthetized mouse is place on the clear Plexiglas shelf at the appropriate magnification level and positioned into the field of view. Whole body images are acquired at 1X magnification, while specific body parts such as the skull, are acquired at 2X magnification (Faxitron MX-20). Grip Strength - The purpose of this test is to determine the muscle strength of forelimbs and combined forelimb-hindlimb by measuring the grip strength of mice. The mouse is held at the base of the tail, lowered over the top of a grid so that only its front paws can grip the grid and pulled back steadily until the grip is released down the complete length of the grid. This procedure is repeated three times (trials) before three more trials are done allowing the use of both forelimbs and hind limbs together (EB1-BIO-GT3 Grip Strength Meter, EB Instruments). Fatigue Grip Strength - This test is a variation on the grip strength test where the muscle strength of forelimbs or combined forelimb-hind limb is measured after inducing muscle fatigue. The mouse is held at the base of the tail, lowered over the top of a grid so that only its front paws can grip the grid and pulled back steadily until the grip is released down the complete length of the grid. This procedure is repeated five times (trials) followed by a 1 minute rest period and five more trials. The grip strength at the beginning of the test is compared to the fatigued grip strength at the end of the test (EB1-BIO-GT3 Grip Strength Meter, EB Instruments). Body Composition - Analysis of body composition uses Dual Energy X-ray Absorption (DEXA) (Lunar PIXImus II, GE Medical Systems) to visualize the tissue mass of the anaesthetized mouse. The image is analyzed to determine the fat mass, lean mass, total mass, and bone mineral content and density. Gait Analysis - This test assesses the gait of a mouse which can be altered in neurodegenerative disorders like Parkinson’s Disease. Mice are placed on a motorized transparent treadmill belt within a clear Plexiglas corral. The treadmill is started at a slow speed and slowly raised to a speed of 17 to 23 cm/sec. The walking motion of the mouse is recorded by the camera which captures the dynamics of the paws and corresponding limbs. The software analyzes all aspects of the gait including braking, propulsion, and swing phases (Treadscan, Clever Systems Inc). ECG - Cardiac function can be assessed in awake or anaesthetized mice. For the awake analysis, the mouse is placed on the recording platform. After a ~5 minute acclimatization period, an ECG recording is taken when the animal is settled and the paws are in contact with the electrodes (ECGenie, Mouse Specifics Inc.) . Echocardiography - Anaesthetized mice are scanned using the non-invasive ultrasound biomicroscope (UBM) (Vevo 2100, Visualsonics) to view the heart and other organs. A high frequency ultrasound transducer is used to capture 2D and 3D data sets; to measure heart function by analyzing moving structures such as the left ventricle; and to measure blood flow velocity (Doppler) within the cardiovascular system. Heart Weight - Abnormal cardiac function can be revealed by measuring the weight of a dissected heart compared to the body weight of the animal. Clinical Chemistry - Cardiovascular panel measures total cholesterol, HDL cholesterol, triglycerides, direct LDL cholesterol, and glucose levels. See Pathology for details. Weight Curve - Weight is measured on a weekly basis to monitor the health of the animal. A sudden drop or increase in weight would indicate illness or abnormal metabolism. Indirect Calorimetry - This test evaluates energy expenditure over 24 hours with an open flow respirometric system. Specially designed cages measure O2 consumption, CO2 production, heat production, and activity. Mice are weighed and individually placed into monitoring cages with bedding and ad libitum access to food and water (Oxymax, Columbus Instruments). Body Composition - Analysis of body composition uses Dual Energy X-ray Absorption (DEXA) (Lunar PIXImus II, GE Medical Systems) to visualize the tissue mass of anaesthetized mice. The images are analyzed to determine the fat mass, lean mass, total mass, and bone mineral content and density. Glucose Tolerance Test - The glucose tolerance test measures the clearance of an intraperitoneally injected glucose load from the body. After an overnight fast (water is available ad libitum), a solution of glucose is administered by intraperitoneal (IP) injection and blood glucose is measured at 0, 15, 30, 60, and 120 minutes using a One Touch Ultra Glucometer (LifeScan Canada Ltd). Clinical Chemistry - Liver panel measures total bilirubin, alanine aminotransferase, aspartate aminotransferase, and alkaline phosphatase levels. See Pathology for details. Urinalysis - A urine sample is collected from awake, restrained mice by gentle bladder massage into a 1.5 ml microtube. A few drops are applied to a urinalysis strip (ChemStrip 5, Roche) to check for renal dysfunction such as abnormal levels of glucose, leukocytes, nitrites, protein, and blood. Clinical Chemistry - Kidney panel measures sodium, potassium, chloride, blood urea nitrogen, creatinine, total protein, phosphorus, calcium, and albumin levels. See Pathology for details. Hematology - Saphenous vein blood (25 μl) is collected in EDTA-coated capillary tubes to measure whole blood on the Hemavet Hematology Analyzer (950FS) (Drew Scientific). The following parameters are measured: white blood cell differential, red blood cell count, hemoglobin concentration, hematocrit, mean corpuscular volume, mean corpuscular hemoglobin, and platelet count. Flow Cytometry - Multi-parameter flow cytometry is used to examine major hematopoietic populations (B, T, NK, DC, myeloid) in mouse peripheral blood, spleen and lymph nodes. Tissues are harvested, processed, stained with a standardized set of antibodies to detect cell type-specific surface markers. Data is acquired on a 4-laser LSR Fortessa (BD Biosciences) and analyzed for frequency and number of defined cell types. Combined SHIRPA (General Health)/Dysmorphology - This test examines abnormalities in behaviour and morphology. The basic behavioural assessment measures muscle, cerebellar, sensory, neuropsychiatric, and autonomic functions by observation for a variety of normal and abnormal spontaneous behaviours and also measures activity levels, arousal, respiration, gait, muscle tone, reflexes, and aggression. Each mouse is observed first for behaviour and then gently scruffed while examining the condition of the coat hair, skin, head, external genitalia, forelimbs, hindlimbs and tail. Open Field (Anxiety/Activity) -This test measures the animal’s activity within an arena in three dimensions using an infrared beam tracking system (Med Associates Inc.). It can assess a combination of locomotor activity, exploratory drive, as well as various aspects of fear or anxiety. Rotarod (Motor Coordination and Balance) - The rotarod test is used to assess motor coordination and balance in rodents as well as motor learning ability. After acclimation and a short learning period, the time (latency) it takes for the mouse to fall off a rod (Accelerating Rotarod, Harvard Apparatus) rotating at different speeds or under continuous acceleration is measured and recorded. Three separate trials are performed in a single day with a 15 minute break between them. In order to assess motor learning ability, this procedure is repeated for two additional days and any increase in latency to fall is analyzed. Acoustic Startle Reflex & Pre-pulse Inhibition (Sensorimotor Gating) - This test is an acoustic startle model of sensorimotor gating in which a weak acoustic stimulus (the pre-pulse) is used to decrease the reflex response (startle) produced by a second, more intense stimulus (the pulse) in mice (SR-LAB ABS System, San Diego Instruments Inc.). Pre-pulse inhibition (PPI) provides an operational measure of sensorimotor gating which reflects the ability of an animal to inhibit sensory information correctly. Deficits in PPI are associated with several psychiatric disorders. Tail Suspension (Depression) - The tail suspension test is a fully automated test used to measure the duration of immobility that is inferred as an index of behavioural despair (the animal has resigned to not being able to escape). The software measures both the immobility time and the force of the struggle over a 6 minute period (Tail Suspension System, EB Instruments). Fear Conditioning (Learning and Memory) - This procedure is used for measuring aversive learning and memory. The mouse is first conditioned to associate the background context cues of a testing chamber (Med Associates Inc.) with an audible tone (CS, conditioned stimulus) which is co-terminated with a foot shock (US, unconditioned stimulus). After conditioning, the CS or the spatial context elicits, in the absence of the US, a central state of fear that is expressed as reduced locomotor activity or total lack of movement (freezing). The time spent immobile is used as a measure of learning/memory performance. The mouse is returned to its home cage for 24 hours and then placed back into the same testing chamber and the time spend immobile is recorded. After returning to its home cage for 2 hours it is returned to the testing chamber that now has different background context cues. The mouse spends time in this novel environment before an audible tone is played and the time spent immobile is measured again. Gait Analysis - This test assesses the gait of a mouse which can be altered in neurodegenerative disorders like Parkinson’s Disease. Mice are placed on a motorized transparent treadmill belt within a clear Plexiglas corral (Treadscan, Clever Systems Inc.). The treadmill is started at a slow speed and slowly raised to a speed of 17-23 cm/sec. The walking motion of the mouse is recorded by the camera which captures the dynamics of the paws and corresponding limbs. The software analyzes all aspects of the gait including braking, propulsion, and swing phases. Tremor – The tremor test is used to quantify a tremor in mice. The animal is immobilized by placing it in an adjustable holder and the holder is placed on the platform in a sound attenuation chamber for five minutes. The meter records rapid repetitive movements and distinguishes between long and short tremor events. Beam - The beam test measures motor coordination in mice. The beam apparatus is made up of two platforms that are connected with a long round beam that is suspended 50 cm above the floor. One platform is brightly illuminated while the opposite platform is dark and contains a box providing an enclosed safe place for mice. A total of four consecutive training trials are performed on the first day. On the following day only one test trial is performed. The latency to traverse the beam and number of times the hind feet slip off is recorded. Vertical Pole - This test is a measure of motor coordination and balance. Each mouse is placed head upwards at the centre of a round metal rough-surfaced pole (60 cm long, 1 cm diameter). The pole is inclined at 90 degrees and the time taken for the mouse to turn downwards and completely descend the pole is recorded. Morris Water Maze - This test is used to evaluate spatial reference memory in rodents. Mice are trained to escape from water by swimming to a submerged platform (1 cm under surface) using only distal extra-maze cues hanging on the walls in each of four quadrants. One cup of non-toxic white paint is used to make the water white and the platform invisible. Multiple trials are run for each mouse over a period of 3-5 days. The latency to find the submerged platform is recorded. Y-Maze - This is a Y-shaped maze used to measure cognitive ability and the willingness of the animal to explore new environments. The mouse is placed in one arm of the three available arms and the tendency to enter the other arms is observed (typically the new arm is preferred). Latency to leave the starting arm, sequence or arm visitations, and number of arm entries are analyzed by automatic tracking software. Object Recognition -This test is used for the estimation of declarative spatial and non-spatial memory in mice. Each mouse is placed in the large arena and exposed to identical objects (plastic cups) that are later displaced/replaced and the time spent exploring each object is recorded. The entire procedure takes 36 minutes after which mice are placed back into their home cage. Open Field -This test measures the animal’s activity within an arena in three dimensions using an infrared beam tracking system (Med Associates Inc.). It can assess a combination of locomotor activity, exploratory drive, as well as various aspects of anxiety or fear. Elevated Plus Maze/Zero Maze - The conflict between the natural tendency of mice to explore and the aversive properties of an elevated and brightly lit open area is observed here. The mouse is placed in the centre of the plus maze (shaped like a plus sign) where it can walk down any of four narrow runways. Two runways are well lit and open while the other two are enclosed with walls and are dark. The elevated zero maze consists of two opposite, enclosed quadrants and two open quadrants and the mouse is placed in the center of an open quadrant. Both mazes are raised about a meter above the floor and mice are tested for 5 minutes. The animal movements in the mazes are recorded and analyzed using video tracking software. Light-Dark Box - This test is used to assess anxiety levels in mice. The apparatus consists of a dark compartment that is inserted into one half of the open field Plexiglas arena leaving the other half brightly lit and open. The mouse is placed into the arena for 10 minutes and time spent in each compartment is recorded and used for analysis. Tail Suspension - The tail suspension test is a fully automated test used to measure the duration of immobility that is inferred as an index of behavioural despair (the animal is resigned to not being able to escape). The software measures both the immobility time and the force of the struggle over a six minute period (Tail Suspension System, EB Instruments). Forced Swim - This test is used to measure behavioural despair and to evaluate the effect of antidepressant compounds. Mice are forced to swim in an unescapable situation in a 4L beaker, filled with water to 60% capacity. After a period of vigorous struggling, the animal becomes immobile, or makes only those movements necessary to keep its head above the water. The immobility observed in this test (from the 2-6 min period) is considered to reflect a state of despair (the animal is resigned to not being able to escape). Mice are closely monitored during this period to ensure there is no risk of drowning. Social Interaction - The three-chamber sociability test assesses general sociability, social memory, and interest in social novelty. Following adaptation to the empty social chamber (Sociability Cage, Noldus Information Technology), the mouse is given access to two pencil cups, one in each of the outside chambers. One cup hides an unfamiliar mouse under it, while the other one remains empty. Soon thereafter, another novel mouse is placed underneath the empty cup. The time spent sniffing each pencil cup, the time spent in each chamber, and the number of entries into each chamber is recorded during a 20 minute period. 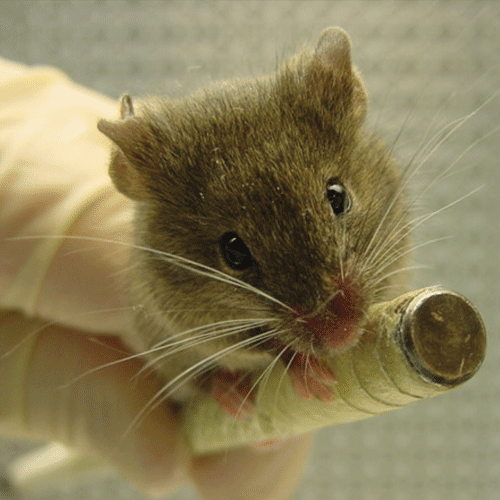 Resident Intruder (Aggression) - This test estimates aggression in male mice. Mice are individually isolated for 1 week. An unfamiliar mouse of the same age and weight is then placed in the cage of the resident and the social behaviour is observed for 10 minutes. The test is interrupted if the duration of intensive aggression is more than 2 minutes. If necessary, the test may be repeated 3 times with 1 week intervals in order to enhance aggression. Tail Flick - The Tail Flick test is used to assess pain sensitivity (nociception). The time it takes for an animal to rapidly remove its tail from an intense heat source (Columbus Instruments) is used as an index of peripheral pain response. The automated tail flick detection is measured with three different trials with inter-trial intervals of at least 60 seconds. Hot Plate - The hot plate test is used to assess acute pain sensitivity (nociception) to a thermal stimulus. The mouse is placed on a 52°C hot plate and removed as soon as it displays any reaction to the heat including paw shaking, licking, and jumping and the time is recorded. If the mouse does not react to heat after 30 seconds, it is removed to ensure there is no damage to the surface of the paws. Olfactory - This test is used to detect anosmia, a total absence of the sense of smell. A piece of gauze with a strong and pleasant odour (i.e. vanilla extract) is placed into the test cage together with a control piece soaked with water only. Latency to the first sniff and time spent sniffing each piece of gauze is recorded during a 5 minute period. Auditory Brainstem Response (ABR) - This test assesses the response of mice to sound cues that may reveal total or tonal deafness. Skin needle electrodes are placed under the skin at the top/vertex of the head (active electrode) and overlying the left bulla (bony sheath enclosing the middle ear by the mastoid bone) (reference electrode) and right bulla (ground electrode). The animal is placed within a special acoustic chamber (Tucker Davis Technologies) in a natural prone position, paws forward, facing the loudspeaker and the ABR is recorded during a series of sound stimuli including tone pips between the frequencies of 6 and 30kHz and over levels of 0 - 100 dB (in 5dB increments). Electroretinography (ERG) - ERG testing provides a measure of retinal function, capturing the electrical potential generated by the retina in response to flashes of light. The full visual field of an anaesthetized mouse is exposed to flashes of light to stimulate the entire retina. Analysis with lower intensity flashes on mice that are dark adapted records the functional response of rods (night vision) followed by light adaption to measure the functional response of cones (acuity) (ColorDome, Diagnosys LLC). We assist researchers who are designing, budgeting, and conducting robust and reproducible experiments that use the mouse as a model system. We also help researchers who are analyzing and interpreting their experimental data. © 2018 Copyright The Centre for Phenogenomics.